Silent QSK ... a dream come true. I remember buying the Alpha 89 years ago and being somewhat dubious as to the pin-diode switching scheme. Sure enough, a year later two of the diodes blew and it was to be a very expensive repair. Very expensive. I did some research and found a diode that should work ... and bought them from DigiKey. Nineteen cents a piece. I ordered ten! With my new 6600 I can configure QSK mode, totally silent, and the Alpha amp runs legal limit all night and day without any clicking and clacking. Silence is golden. I'm slowly ramping up to 30-35 wpm and it is a joy to operate. I should say however, that getting into QSK mode is a bit of a juggling act at this juncture. There is some interaction with the ATU that disables QSK so I am running without ATU. This appears to be well documented. The issue mandates I disable the ATU, select a different slice, and then enable the QSK slice. QSK magic happens! One last gush of praise. I purchased a 43" LG at Best Buy for dirt cheap and it renders SmartSDR beautifully well. Bodacious even! Oh yeah ,... 73's and Happy New Year! FRStack is transformative ... a must have. I think the Flex 6000 lost the ability to run QSK with the ATU in use, a few software versions ago. I used to run QSK mode with the ATU on and it worked fine. Back then I was running a 6500 but I think the hardware design is still the same on my Flex6600. I now use the 6600 to drive my amplifier so do not need the ATU function on. I appreciate the "trick" of selecting another slice with out the ATU on and then using QSK again. I had to re-boot the 6600 every time I forgot and turned on the ATU. My guess is, it is not a hardware limitation but they dropped the QSK with ATU at one of the Software Revisions. Hopefully they can fix it for when I want to run barefoot with ATU on and QSK mode. In the interest of having praise where praise is due, I use PTT to put the radio into transmit during CW keying from a computer (contesting). Due to a fault in the QSK implementation you are praising, I have to listen to QSK audio in my headphones with just a loud hiss between CW elements (due to the antenna relay being connected to the transmit chain not the receive chain). I have to listen to the ADC sampling 'nothing' between sent CW elements which is extremely tiring and has caused many contesters to leave the 'Flex experience'. The only way to make this fault tolerable is to turn the 'delay' value up to stop the false QSK audio. In so doing the radio then enforces this delay on its TX -> RX changeover which makes the radio useless for catching fast callers. The pleasure you are describing has come at a cost to CW contesting. It makes me wonder exactly how much of the QSK audio you are listening to between sent CW elements actually comes from the antenna and not an open circuit receive port. You have a valid point but in this case, I'm using a Flex 1500 and a small amplifier. I've set the transmit delay to 1200 ms so there aren't any inter-element T/R transitions happening, just the clacking during long pauses. I've noticed a large amount of audio hissing in the headphones in the past but I've alleviated much of this by switching from high gain, sensitive headphones to a set of Bose headphones with the configurable gain set to 'low'. I try to stay informed as to how well the new Flex radios handle qsk in the event that I should choose to upgrade. QSK is of little added value, flawed or perfect, to my operating style. My point(s) is that there is a workaround to the current errant QSK implementation, and that my $2500 amplifier supports QSK and legal-limit without a sound to be heard. An innocuous comment borne from the fact that everyone seems so concerned with fan noise and relay clacking with newer solid-state amplifiers. How effective is the current implementation? Beyond my interest though I can certainly make some measurements here in the lab to further the discussion. Very cool. I can run full QSK on my 6600 but I rarely do simply because I have yet to get used to hearing things between my dits and dahs. I do like to use my SPE Amp and while it is solid state and switches very fast I am not totally sure it would tolerate true QSK... but maybe. My first rig was a Drake 2B and a Heath DX-60 & outboard VFO. I don't recall what TR switch I had with that but I could hear between my dits and dahs, so that is what I was used to. I replaced that with a clicky-clacky Kenwood TS-520 and I've not had a full break-in rig since. One of these days I'll have another full break-in rig and I'll probably also find it too distracting to use but that is my gold standard until then. Wow this brings back memories. Back in the early 60's I ran traffic for SNJ in the NTS system then up to 2RN in New Jersey. Handled a lot of traffic for the Coast Guard Base in Cape May. We all ran QSK to handle traffic. 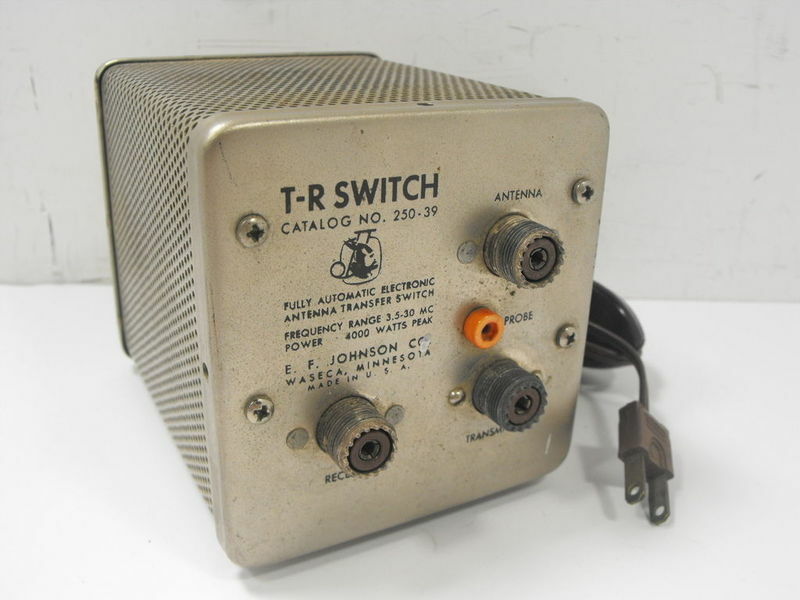 My station was a DX60, Drake 2B, and the Johnson TR switch. We would not use a side tone but rather would listen to our own transmitted CW signal. Brings back great memories! I was experiencing the interaction between the ATU and QSK on my Flex-6600. I was able to confirm by trial and error that it's possible to operate QSK with the ATU on. However, it gets disabled if a tuning cycle is started. I had to switch antennas on the panel back and forth to get QSK back on. Tim was able to confirm that some of this erratic behavior is due to an issue in SmartSDR that they are currently correcting. In my case, increasing the CW speed above 30 WPM and the delay way above 0 does not deactivate QSK, which I believe it's the way it should work according to Flex. Anyways, hopefully they solve this pronto. I really hate the noise generated by the mechanical relay. The pin-diode/reed relay combination is almost inaudible, when it works! Thanks for the info. I like to run QSK all the time. Just tried it with the ATU on. I only use ANT 1 so just switched the red (xmit) to ANT2 then back to ANT1 and presto the ATU still on and I am in QSK mode with no noisy relays. I hope they can fix the bug with the next Software update but I am OK for now. P.S. Icom uses the same method on the 7600 and above. PIN diode on xmit side and small quiet relay on the receive side. Actually I think it is the best approach. You do not need a big noisy relay to handle the xmit RF power and on RX the small relay is better, no IMD products developed from the diode mix effect. This thread got me reflecting upon my Novice beginnings in 1965. Homebrew transmitter, Xtal controlled of course, BC-348P receiver fresh out of a B-17 bomber, and a single wire antenna going out the screen window of my bedroom and laying upon the roof where my dad hopefully wouldn't notice it. Going from Receive to Transmit on CW - reduce RF/AF gain on receiver, knife switch over to Transmit position, flip toggle switch to XMIT, adjust receiver gain to monitor my sending, check NE-2 neon bulb next to tank coil to verify transmit. Send message at 5 WPM, avoid contact with key-contacts and voltage on 807 cathode. Don't touch knife switch when keying. Reverse process on Receive. And the odd thing is ... I miss all that! Kinda sorta if you know what I mean. Wouldn't you need a DPDT knife switch? You are correct. This 'knife' switch just wouldn't 'cut' it. Sorry for reviving this subject again. I attended Orlando Hamcation this year and had a chance to chat with the Flex folks quite a bit. I was a bit surprise to find out that Steve Hicks and Matt Youngblood were unaware of any work on SSDR to correct the erratic QSK operation on the 6600. This was per my conversation with Tim Ellison. Anyways, I would like to confirm if this is something that we should expect to see corrected in V3 or an updated version of V2. BTW, I can care less about QSK; however, I would like to enjoy the benefit of using the pin-diode/reed relay combination for silent T/R switching. The mechanical relay is super loud on CW, almost comparable to my old Apache Labs radio (yeah, I know I'm cursing here!). Again QSK on the 6600 is wonderful when it works! There are a lot of issues with the 6000 series product line. I guess it is more important to bring out Multi-Flex than it is to fix the various issues. QSK not working is not acceptable in this class of radio. I am saddened to hear they aren't aware of or addressing the issue. I am literally one day out of my 30 day return window. Had I found this out earlier I would have returned the rig. I operate CW 100% of the time and QSK and ATU operation are critical. Sheesh. You're one day out of your 30 day return window, posting in a 90 day old thread, that was last posted to 30 days ago too. Jay, the issue has neither been resolved nor has FRS explained when it will be. Right, forgive me for being patient, and waiting for a fix, or an official explanation, from Flexradio. Even some official discussion would be nice.